Design flexibility of precast components solves structural deficiency issues while maintaining design of original structure. The SR 209 East Broad Street Bridge in Tamaqua, PA. The use of precast concrete in construction addressed the aesthetic and structural demands for the project while maintaining historical integrity. We set out to develop a restoration design that would rehabilitate the stone masonry arches while replacing the sidewalks with a new system that complemented and honored the bridge’s historic arch core. 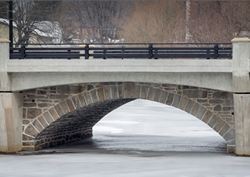 A major rehab project on a historic bridge in Tamaqua, PA relied on the use of structural precast concrete to solve structural deficiency issues while maintaining the historic design and integrity of the original structure. Northeast Precast was the precast partner for this project, which earned industry accolades from the Precast/Prestressed Concrete Institute (PCI). Northeast Precast is located in Cressona, PA and is a producer member of the Mid-Atlantic Precast Association (MAPA). The charming, masonry arch bridge in Tamaqua was identified for the rehab project due mainly to the condition of the existing sidewalks. According to inspectors, the original stone masonry core was determined worthy of rehabilitation, but the retrofitted sidewalk structures were beyond repair. It was also determined that the original stone arch core was a contributing element to both national and local historic districts. This designation necessitated the involvement of consulting parties in the project design, including the local Historical and Architectural Review Commission (HARC), which oversaw the design concept and provided input. Because of the bridge’s historical significance, the project team had to devise a way to replace the existing dilapidated sidewalk structures with a new system that was worthy of standing next to a thoroughly-restored stone masonry arch from the 1890s, shared Paul J. Rea, senior associate with Ammann & Whitney, the project engineer. For this reason, Rea and his team chose a precast concrete solution. “The design flexibility provided by precast concrete allowed us to develop a system that was fully functional and simple to construct, yet aesthetically pleasing and complimentary to the historic stone masonry arch,” added Rea. The structural system included prestressed, haunched concrete beams as the main focal point of the proposed new sidewalk structure. Arched variable depth shapes allow for a long-span look that complements the adjacent stone arches while exposing as much of the historic arch as possible. Earthy tones were chosen for the precast concrete pieces to blend naturally with the original stone masonry. The use of precast concrete also enabled the structure to achieve continuous action for live loads and superimposed dead loads, while allowing for shorter beams to facilitate delivery and erection in a tight urban setting. One of the most innovative features of the project was a scheme to allow the prestressed concrete beams to pass over the dry stack retaining walls and be supported on a solid, integral abutment while creating a faux concrete seat and end diaphragm at the dry stack wall to give the appearance that the beams were supported there with part of the wall all along. “The members of the HARC and the Museum Commission really loved this approach, since it looks historic while meeting current design standards,” Rea said. For video content and a project photo gallery, visit the SR 209 East Broad Street Bridge Project Profile on the MAPA website. The Mid-Atlantic Precast Association (MAPA) is a professional marketing organization committed to the growth and greater profitability of the Precast Industry in the Mid-Atlantic region. Founded in 1978, MAPA is comprised of 13 prestressed/precast producer member firms located throughout the Mid-Atlantic States, including New York, New Jersey, Pennsylvania, Delaware, Maryland, Virginia, West Virginia and Washington, D.C. The organization is closely associated with the Precast/Prestressed Concrete Institute (PCI) and has over 50 associate member companies that produce a variety of concrete industry related products. For more information, visit http://www.mapaprecast.org.